Being an avid reader of technology articles and latest trends in the current advertising industry, I Personally tried to invest at least few hours of the week on learning new things. It’s not a deliberate effort to learn but during the course of working I found my self in the situation where I think “I know nothing Paul ! !”, Well this is the alarming situation. 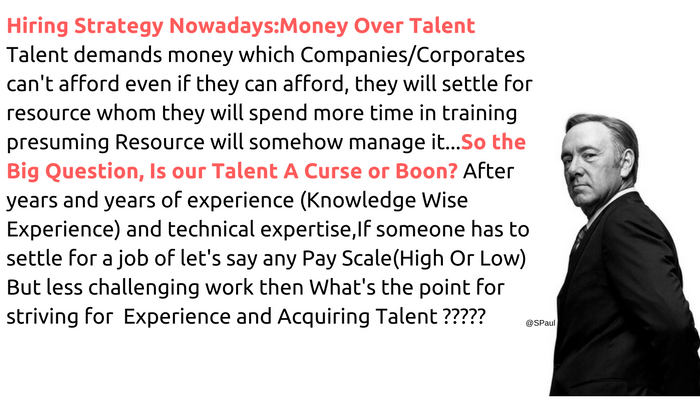 Most of the professional learn new things when either their colleague is doing better or have some skills that you don’t or you are bored with the same job and want to switch organization. Well as always last minute preparation for anything is not for gaining knowledge, It is for keeping your job, reputation alive. I feel that I might not be the right person to tell any of these if I haven’t gone through it personally. My personal experience says, when I was working in my first organization, I was curious to learn new things, thanks to then my colleague who never stopped me in doing any productive work and were always there for me to provide guidance in every aspect of the industry. But there was always a phase when I tried to learn new things just because I want to change my job. Well, let me tell you, nothing that I have read during that phase was learning. Its just things to crack the interview. Well, it happened with me also, lots of time, But then What is the solution? Whenever you come across some work or task that you have never done, Be Proactive! Start working on that. Simple yet complicated, Right? To get work done, you will go through series of small tasks and ultimately when some new task comes up, its those series of small tasks that will help you to complete the whole work. You want to do a task C but to do that you need to go through Task A and Task B. So Task A and Task B are new things you learn. Next time someone comes for Task B, You already know what to do. This is how you learn new things, This would not have been possible if you didn’t go for the Task C which you have never done before. Another way of learning is by helping others to achieve their task, firstly it helps others and secondly, you learn something new. It’s very important to understand that your experience is just mere years of working, But what counts most is the knowledge that you gain over the years. If you don’t know something that client wants to achieve then what is the purpose of keeping you in the organization. If you check in the current market, every now and then, new platform comes and the organization wants someone who has “worked” on it. I am emphasizing on this topic because most of the organizations check their flexibility, If a persona A already worked on the platform it means less time for training and that person can start working soon. But thing is, this is a problematic situation for someone worked over the years on propriety platform Like I did, Instead of looking for the core understanding of the domain, We tend to focus on the platform. Well, my thought on this is, Platform always change, but the working of any platform remain same. So look for the candidate who has the knowledge of the domain and fulfill the overall requirements. At Last Stay hungry for Knowledge Because Knowledge gives you the wisdom to achieve your Goal ! !